Okay...this is mostly for family....but it's nice of the rest of you to stick around. And I won't be sad if you leave now and come back another time when I actually post something useful. 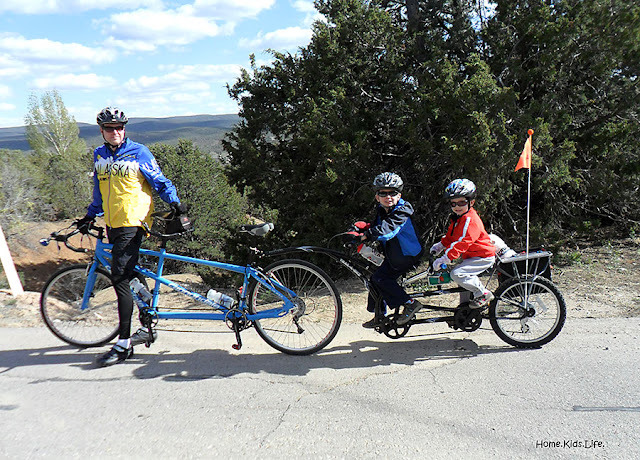 But maybe you're interested in the tandem trail-a-bike...this will give you a little glimpse at it. After we put this baby to more use I'll hopefully write a review on it. Remember that picture I showed the other day of the new addition to our bike family. The tandem trail-a-bike? We took it out on a 10 mile spin the other day. It's maiden voyage. Other than one shoe that fell off towards the end of the ride, it was successful. Bummer that I didn't get the shoe falling off on video. It's hard to hang the camera off my back and take a movie of the munchkins and still pedal. I think sometime we'll hook up our helmet cam to take a movie of the kids. So for you're viewing pleasure, here's a video of the dog in his carrier on the bike. Oh, it also shows the two cuties getting on and gives a side profile of the new tandem trail-a-bike. Yes, we're the crazy dog people who bring their dog along with them. He likes to be with us. For your double viewing pleasure, here's a movie of the kids pedaling home. I only got hit by a tree once while filming, but apparently the camera wasn't actually on at that point. Here's when I finally turned it on. I think they're going to be a good team on a tandem....other than the losing shoe part. But happily...no one got hurt and we were able to recover the shoe. Anyone else ever lose a shoe while biking? I've lost a water bottle before.